Dogwood by Conni Reinecke - 8.000" x 6.125"
Dogwood art print by Conni Reinecke. Our prints are produced on acid-free papers using archival inks to guarantee that they last a lifetime without fading or loss of color. All art prints include a 1" white border around the image to allow for future framing and matting, if desired. Conni Reinecke lives in the beautiful Pacific Northwest in Lake Tapps, WA. 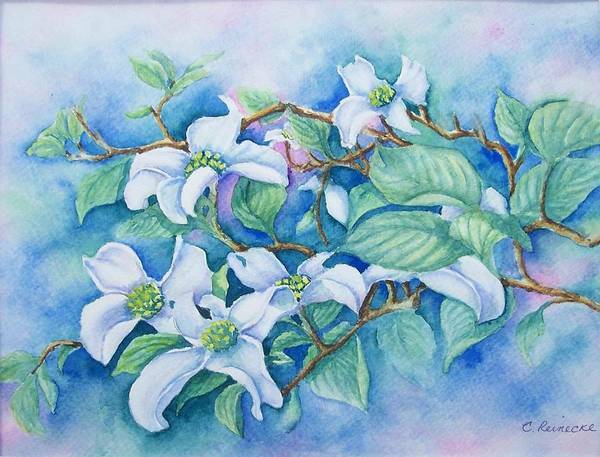 She is a self taught artist who has always had a love of art and nature. 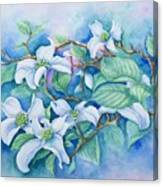 Her main focus in her work is the beauty of nature that we can so easily overlook in our day to day lives. Her love of bold color can be seen throughout her works. 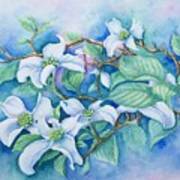 Conni's main medium of choice is watercolor, however, she also enjoys charcoal and pencil drawing as well as pastels.